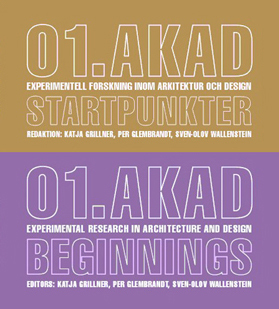 01.AKAD: Beginnings is the first in a series of publications from AKAD, which aim to provoke, promote and discuss new and critically experimental research by architecture and design. This first book is structured around four themes arising from projects initiated within AKAD with financial support from the Swedish Research Council. It includes critical essays and presentations of experimental design and writing projects. The contributors are architects, designers and scholars based in Sweden, Austria, Belgium, Canada, Ireland, Italy, Switzerland, UK, and USA. Over recent years, interest in research by design – or practice-based research in architecture and design – has increased significantly in Sweden, as elsewhere. There are wide-ranging discussions concerning both the need for a more research-driven design practice (today many offices market themselves specifically as being research-based) and the ambition to develop new forms of research in architecture and design that make explicit use of the special kinds of knowledge that are entailed in design processes and experimental design projects. AKAD takes an interest in both these aspects, but actively engages above all in the development of new modes of research in our field.